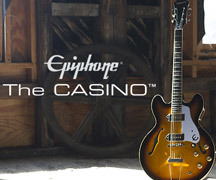 Our friend and long-time Epiphone player Michael 'Jr.' Tash dropped by Epiphone Headquarters this week to give us a sneak preview of the upcoming CD from his band Bad Influence Band. Congrats to our Epi bass man Jack Casady who will be honored with a Lifetime Achievement Award by Bass Player magazine on October 22. The Epiphone Limited Edition 50th Anniversary '1961' SG Special Outfit faithfully turns back the clock and gives you an affordable iconic instrument that sounds and plays like you've stepped back in time.